Finding a fragrance you truly love is a pleasurable challenge; making it last on your skin can be a more frustrating situation. A few years back, Angela wrote a post about ways to make fragrance last longer, and it's still popular. More recently she reviewed a perfume "primer" named Canvas & Concrete, a spray-on base layer that helps the fragrance to "cling" and evolve more slowly. I tried Canvas & Concrete, but it gave me a rash, so I've been on the lookout for an alternative method to make my lighter fragrances stick around longer. Vanacci, a British company that offers men's wallets and watches, has launched a line of "fragrance-enhancing products" including pendants, cufflinks and bracelets. These accessories all incorporate "Lockstone," a "microabsorbent" material that reportedly holds and gradually releases perfume so its scent lasts seven times longer than it would on your skin. I was curious enough to try a Lockstone item, especially since the products have a simple, minimalist look. For my semi-scientific trial, I've been wearing Vanacci's Solaris Nebula bracelet, which happens to mesh easily with my usual wristful of silver bangles and black leather cuffs. Its shimmery deep-blue beads are the decorative part, and the matte black "planet" beads (one shaped like a mini Saturn!) are the Lockstone section. Following the directions, I sprayed the black Lockstone beads generously with fragrance, allowed the bracelet to sit and absorb the liquid for a few minutes, then put it on and went on my way. I decided to test Lockstone with two of my most evanescent perfumes. First, I tried Guerlain Après L'Ondée Eau de Toilette, which Robin has described as "an ephemeral experience." Following the directions, I generously applied Après L'Ondée to the Lockstone beads, let the bracelet sit to dry for a few minutes, and put it on before leaving for work. I also spritzed my arm at the same time. As usual, Après L'Ondée's violet-and-iris beauty vanished from my skin in less than two hours. On the bracelet, however, it lingered throughout the day. It didn't radiate from the stone the way it does from warm skin, and it felt a bit "flatter," but there it was, eight hours later. Impressive. It clung to the beads for another two days, growing fainter and fainter until it was finally gone. Although Vanacci recommends using a different Lockstone accessory for every fragrance, I decided to test the Solaris Nebula with another one once the Guerlain had finally faded away. I got out my bottle of L'Artisan Parfumeur Drôle de Rose, another lovely scent that refuses to stick around for long. Similar results: Drôle de Rose was gone from skin long before lunchtime, but the bracelet still held a muted scent of candied violets and roses for me to enjoy during my evening commute. In both cases, the fragrance didn't smell quite like it does on my own skin — it felt a little more linear and "matte," if that makes sense — but I enjoyed being able to take a sniff of Après L'Ondée or Drôle de Rose whenever I liked throughout my day. Of course, I could also fill a tiny atomizer with the scent of my choice and re-spritz mid-day, and I do that sometimes, too. But if you want a lower-sillage experience, or you're not in a situation where you can re-apply perfume on a whim (e.g., most workplaces), an accessory like this one might be worth seeking out. 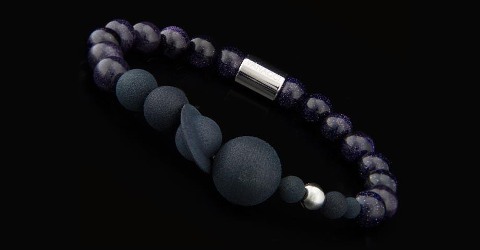 Vanacci Lockstone bracelets (£34.99 and up) are available through the Vanacci website. Lockstone pendants (£24.99 and up) and cufflinks (£24.99) are also available. Sounds like a fun idea and I love seeing a Lockstone in a shape of little Saturn (probably my favorite planet in the Solar System). It’s definitely priced as jewelry (which it is, of course) — and I’m not good with exchange rates, but they rarely seem to work in my favor, either. That bracelet is gorgeous. That’s impressive that it works so well. I actually like the style a lot. It blends in with my other arm jewelry! Lots of perfume jewelry (pendants, diffusers, etc.) is very Renaissance Festival-ish, which just isn’t my thing. I wonder! I didn’t spot any detailed explanation of it in the brochure, unless I missed something. Something porous like basalt/pumice might work quite well – I guess that’s the lava stone mentioned below. If it’s too porous it will eventually get tainted, I guess. Jessica, Butting in to say I’ve been using a lava stone bracelet for years that does this very same thing…mine has a carved bone skull attached that has turned a lovely amber color after being subjected to perfumes. Ha! I do like the bracelet pictured here, especially the Saturn piece, but for those who like the concept but would rather do it themselves and save money to spend on perfume, I hope this info helps. The bracelet is attractive, and that little Saturn bead is adorable! I wonder, though, if simply spraying the fragrance on one’s clothing would work as well. I’ve actually never done that, to my recollection. My only successful “trick” for extending fragrance life on my skin has been moisturizing with a rich lotion like Kiehl’s Creme de Corps or Alba Botanica Very Emollient Body Lotion before applying the scent. Lotion really does help make scent last longer! I like Lubriderm, too. I tend not to spray perfume on my clothing, because I’m afraid of staining or of getting stuck with the scent if it *does* last too well! I did test Apres L’Ondee on a cotton-weave scarf one day last week, though (as a “control” for this test!) and it vanished pretty quickly. Hey all!! Long time no see/read/sniff!! Wow- these are so cool and the perfect color – Earth being gold and Jupiter-> being my planet is difficult to resist but being Italian made Oh MAN – am I IN! …..ahhhhh and it feels nice to be back;)!!???? Good to see you, and I hope you’ll report back on the bracelet, too! Great to see you, Angela! Nice review, i am primarily a spray and walk into the mist perfume wearer so having an item saturated with perfume (albeit dry enough to wear) is making my skin itch just thinking aboit it. On the other end of the spectrum, we have By Kilian with its uber expensive jewelry collection. The one tbat looked interesting to me was a gold chain with a hollow cage pendant inside of which a tiny white block emanated whatever scent came packaged with it (It’s possible that one may have a choice ofns ent). Francis Kurkdjian has those little leather bracelets that are supposed to be permeated with fragrance, too. I’ve considered them but never took the plunge! That saturn bead makes it magical. There are many enticing stone options for the decorative beads on the website, from lapis to hematite. Those shimmery blue beads really work with the planet theme, though. I love that there are “with Pluto” and “without Pluto” options, too. If you’re looking for a way to get the effect less expensively, wood jewelry can frequently act the same way since wood is very porous. I have a wooden necklace that I picked up on a trip to Ghana years ago and it must have been hit by a spray of one of my fragrances at some point (I think when I was testing Cuir Ottoman) because it still radiates with it, all these years later. Thanks for the review! Always interested in perfume paraphernalia. That sounds really lovely — a souvenir of several experiences! I do love any kind of perfume paraphernalia!